The Political Environment: For WI waters, orange is the new brown. Or blue-green. For WI waters, orange is the new brown. Or blue-green. Well, Bucky, your DNR has enabled brown water, and blue-green water, so add orange to your color-coded collection of water-borne contaminants. In 10 million gallon increments. Which is how it all works in a state where the DNR is now intentionally-managed with a 'chamber of commerce mentality,' not according to its old-timey environmental mission. 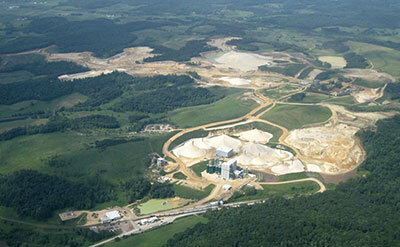 There's a DNR photo below of a Wisconsin frac sand mine, but the agency doesn't feature their up-to-date their numbers. Total Number of Industrial Sand Facilities (Mines, Processing & Rail Loading)128.